Retail Price: $40.00 Log in for LOWEST PRICE! 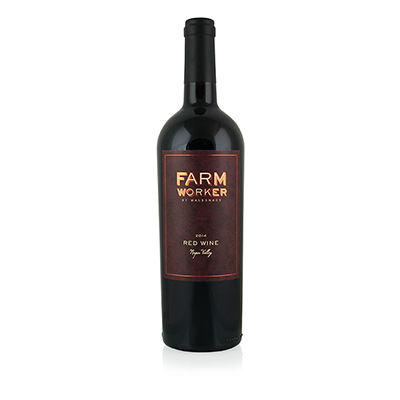 Farm Worker Red Blend comes from our friends at Maldonado Vineyards in Napa. It is primarily Cabernet Sauvignon with additions of Merlot and Syrah for increased complexity. Lupe Maldonado has been farming vineyards in Napa for nearly 50 years. He now has his own property - where our lovely selection was crafted - as well as managing vineyards for others. The Maldonado story is more about hard work, dedication and frugality than it is about rags to riches. Lupe came to the U.S. from Mexico, started a family, and supported them through his talent as a farm worker. It allowed him to save enough money to eventually have his own vineyard and winery. Best of all, Lupe runs it with his entire family onboard. His son, Hugo, got his degree in Viticulture and Enology from the University of California in Davis, and brings another level of expertise to the partnership. For Lupe, this wine is a tribute to the farm workers, like him. Now, he hires farm workers who have the same dream and potential he did almost half a century ago. Grape growing is not only hard work, it's one of the most difficult crops there is. Grapes are susceptible to more diseases and more pests than any other. But, the product is also like no other. This selection says all Napa, with earth and chocolate nuance balanced with Bing cherry fruit and a fabulous finish.